A non-governmental organization (NGO) is a not-for-profit organization that is independent of states and international governmental organizations. They are highly diverse groups of organizations engaged in a wide range of activities and take different forms in different parts of the world. NGO’s responsible for horseshoe crab conservation are listed below by U.S. state and by other countries. We highlight the Ecological Research & Development Group Inc. and the IUCN SSC Horseshoe Crab Specialist Group not because their work is of greater significance, but because they are the only NGO’s with a global focus as it pertains to the world’s four horseshoe crab species. The Ecological Research & Development Group (ERDG), founded in 1995, is a 501(c)3 non-profit wildlife conservation organization, whose primary focus is the conservation of the world’s four horseshoe crab species. Visit About ERDG to learn more. The IUCN SSC Horseshoe Crab Specialist Group is currently revising the IUCN Red List Assessment for the three Asian horseshoe crabs species, (Tachypleus tridentatus, Tachypleus gigas and Carcinoscorpius rotundicauda) which are currently listed as Data Deficient. The Horseshoe Crab Specialist Group has completed its assessment of the Asian Tachypleus species whose status throughout its spawning range goes from Endangered to On The Verge of Extinction. 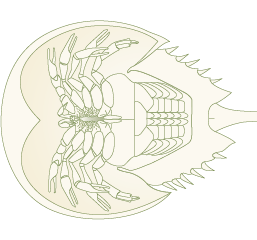 Although not finished with the assessment of the two other Asian horseshoe crab species, their status is beginning to look very much the same. No non-governmental organizations (NGO’s) or university projects focused on horseshoe crab conservation. University of New Hampshire Horseshoe Crab Monitoring Program began in 2012, with the goal to understand the population dynamics of horseshoe crabs in Great Bay Estuary, New Hampshire. Conducting extensive daily surveys, the University of New Hampshire in partnership with the New Hampshire Sea Grant Coastal Research Volunteers and the Great Bay Discovery Center, involves citizen scientists (students and volunteers from the University of New Hampshire and the local community) to survey horseshoe crabs as well as tag horseshoe crabs in Great Bay Estuary. In 2016, the Horseshoe SOS SmartPhone app was added to the program to gather more information to the surveys as well as provide information to the public about New Hampshire horseshoe crabs via the programs Facebook page. Massachusetts Audubon Wellfleet Bay Sanctuary education, community outreach, habitat preservation, annual spawning survey and tagging on the Outer Cape. The Watch Hill Conservancy seeks to preserve its unique coastal community. They have partnered with Connecticut’s Sacred Heart University, Project Limulus and produced a video about their experience. Project Limulus of Sacred Heart University research and education on the ecology and conservation of horseshoe crabs as well as coastal habitat restoration, community outreach, annual spawning survey, tagging, and research on Long Island Sound estuaries and pocket beaches. Ash Creek Conservation Association education, community outreach, habitat restoration and tagging along Ash Creek tidal estuary. Audubon Connecticut education and community outreach. The Branford Land Trust the BLT owns 950 acres and has 400 acres of conservation easements in Branford, CT and along the Long Island Sound east of New Haven, education, community outreach and habitat preservation. The Bruce Museum and Seaside Center education, community outreach, assists in horseshoe crab tagged. The Connecticut Audubon Society have nature facilities all over Connecticut, managing 19 wildlife sanctuaries and preserving 2,600 acres of land. Their CT Coastal Audubon Center in Milford helps with public outreach on horseshoe crab conservation and Milford Pt. is a no-harvest area for spawning Limulus. The Connecticut Association of Biology Teachers (CTABT) encourages biology teachers to participate in state and local activities to keep themselves up to date on their local biology. This is to help better teach students current biological news and issues and they have participated in Project Limulus. The Connecticut Surfrider Foundation education and community outreach in partnership with Project Limulus. The Denison Pequotsepos Nature Center education and community outreach in partnership with Project Limulus. The Guilford Land Conservation Trust education and habitat protection. The Mystic Aquarium education and community outreach. The Sherwood Island Nature Center education and community outreach. SoundWaters is an organization dedicated to protecting the Long Island Sound using education and action. They are committed to ensuring that every child has access to their programs no matter their ability to pay. They are active members of Project Limulus. The Southeastern New England Marine Educators are a group of professionals dedicated to marine education in Connecticut and Rhode Island. Their members are participants in Project Limulus. The Maritime Aquarium education, community outreach, participates in collaborative research with Sacred Heart University and Project Limulus. The Nature Conservancy participated in Project Limulus. Cornell Cooperative Extension of Suffolk County coordinates and manages the New York State Horseshoe Crab Volunteer Monitoring Network conservation research, monitoring and tagging throughout New York State’s coastal waters. Group for the East End in the classroom education and community outreach about horseshoe crabs, spawning survey and tagging in the Peconic Bay, at South Harbor Beach and Southold. Molloy College, Center for Environmental Research and Coastal Oceans Monitoring (CERCOM) education, community outreach, research & development, captive breeding and release on Long Island beaches. New York City Audubon education, community outreach, habitat preservation, spawning survey and tagging in Jamaica Bay, Plumb Beach, Big Egg and Dead Horse Bay. New York Horseshoe Crab Monitoring Network The New York State Horseshoe Crab Monitoring Program (Cornell University Cooperative Extension and New York State Department of Environmental Conservation) has been working with volunteers since 2008 to monitor the spawning activities of horseshoe crabs across various reference sites in New York’s Marine District. They currently have 18 reference sites with trained site coordinators that lead volunteers in the annual monitoring surveys and tagging efforts for twelve survey nights in May and June. The program manages over 500 volunteers annually and the data is directly used to assist with the NYSDEC’s annual conservation management actions. New York State Office of Parks Recreation And Historic Preservation educational programs and exhibit at the Theodore Roosevelt Nature Center Jones Beach State Park; spawning survey and tagging in Jones Bay. New York City Parks habitat restoration, monitoring and tagging at Calvert Vaux Park, Kaiser Park, Conference House Park, Brooklyn, Staten Island and New York City. Seatuck Environmental Association horseshoe crab conservation, policy and advocacy, horseshoe crab monitoring and tagging at Captree State Park. The WaterFront Center education and community outreach program through the WaterFront Center in Oyster Bay and at various school districts, spawning survey and tagging in Oyster Bay. American Littoral Society education, community outreach, habitat preservation, annual spawning survey and tagging on Delaware Bay beaches. Bayshore Discovery Project education, community outreach, habitat preservation, annual spawning survey and tagging on Delaware Bay beaches. Bayshore Regional Watershed Council education, community outreach, spawning survey and tagging on five Sandy Hook Bay and Raritan Bay beaches in Monmouth County. Conserve Wildlife Foundation of New Jersey community outreach, habitat preservation, annual spawning survey on Delaware Bay beaches. New Jersey Audubon education, community outreach, habitat preservation, annual spawning survey on Delaware Bay beaches. Wetlands Institute education, community outreach, habitat preservation, annual spawning survey on Delaware Bay beaches. Abbott’s Mill Nature Center education, community outreach, annual spawning survey and tagging on Delaware Bay beaches (Slaughter Beach). Delaware Center for the Inland Bays education, community outreach, habitat preservation, annual spawning survey and tagging on Delaware’s Inland Bays watershed. Delaware National Estuarine Research Reserve education, community outreach, habitat preservation, annual spawning survey on Delaware Bay beaches (Kitts Hummock, Ted Harvey Wildlife Area, North Bowers Beach). DuPont Nature Center education, community outreach, annual horseshoe crab festival. Ecological Research & Development Group Inc. education, materials and programs, community outreach, habitat preservation, annual spawning survey and tagging, research & development, throughout the world’s four species spawning range. The Nature Conservancy Delaware community outreach, habitat preservation, annual spawn survey on Delaware Bay beaches (Big Stone Beach and Bennets Pier). Anne Arundel Community College education and tagging along the upper Chesapeake Bay. Virginia Institute of Marine Science research and development into alternative baits for the conch and eel fisheries. data deficient: name of NGO(s), link to website and description of what they do as it pertains to horseshoe crab conservation and their area of operation. ACE Basin National Estuarine Research Reserve annual spawning survey and tagging on Beaufort County beaches (Harbor Island, Coffin Point). Georgia Southern University education, research & development, annual spawning survey and tagging on St. Catherines Island. University of Georgia Marine Extension Service education, community outreach, host of Green Eggs and Sand horseshoe crab/shorebird teacher workshops since 2005 on Skidway Island. The FWC Fish and Wildlife Research Institute (FWRI) enlists the public to help identify horseshoe crab spawning beaches within the state of Florida. Marine Discovery Center in New Smyrna Beach annual spawning survey. Nature Coast Biological Station in Cedar Key annual spawning survey. Dauphin Island Sea Lab research, education, community outreach and estuarium, on this 17-mile long barrier island surrounded by Mobile Bay, Mississippi Sound and the Gulf of Mexico. Kujukushima Aquarium education, community outreach, habitat preservation, annual spawning surveying, research & development, captive breeding and release throughout the Kujukushima Bay. Nihon kabutogani wo mamoru kai (The Association for Protecting the Japanese Horseshoe Crab) and the Kasaoka City Horseshoe Crab Museum are located in Kasaoka City, Okayama Prefecture. This association was established in 1978 and is the only place in Japan to be designated a Natural National Monument to the species. The association campaigns to protect the horseshoe crab species and to improve and maintain the environment for other marine organisms throughout Japan. It has five branches and approximately 1,000 members, located in various prefectures throughout the Japanese horseshoe crabs spawning range. Each branch conducts such activities as coastal cleanup, ecological surveys, egg production surveys, and eelgrass planting projects to regenerate seaweed beds. The organization holds a general meeting once a year; conducts research conferences, observation tours of the breeding grounds, and public lectures involving citizen participation. Together with the public, the association promotes activities for horseshoe crab and marine environment conservation. Yamaguchi Kabutogani Kenkyuu Konwakai ( 山口カブトガニ研究懇話会）education, interpretive center, community outreach, habitat preservation, spawning surveying, captive breeding and release throughout the Yamaguchi Bay and Hirao Bay in Yamaguchi prefecture. Fauna & Flora International (FFI) (China) working with BRC on population monitoring, education, community outreach, habitat conservation, and public participatory release in selected coastal habitats and surrounding communities and cities. Guangxi Beihai National Wetland Park (China) collaborating with BRC on public participatory nature experiences and HSC release in their park. Guangxi Biodiversity Research and Conservation Association (BRC) (China) population monitoring, education, community outreach and development, habitat conservation, citizen science, public participatory release, and “NO Horseshoe Crab Consumption Campaign” in selected coastal habitats and surrounding communities and cities. Guangxi Institute of Oceanography (China) Dr. Chen Ruifang is working on horseshoe crab breeding and release and collaborates with BRC on public participatory horseshoe crab release activities. Guangxi Hepu Dugong National Nature Reserve (China) conducts horseshoe crab survey with BRC. City University of Hong Kong education, community outreach, habitat preservation, research & development, captive breeding and release throughout Hong Kong’s spawning beaches. Ocean Park Conservation Foundation Hong Kong education, community outreach, habitat preservation, annual spawning surveying, research & development, captive breeding and release throughout Hong Kong’s spawning beaches. International Islamic University Malaysia, Horseshoe Crab Research Unit education, community outreach, habitat preservation, spawning survey, captive breeding and release. Nature Society of Singapore education, community outreach, habitat preservation, annual spawning surveying throughout Singapore’s spawning beaches. Institute of Ecology and Biological Resources (IEBR) Department of Aquatic Ecology and Environment. Association for Biodiversity Conservation (ABC) is a conservation organization based in Odisha, whose objective is the conservation of the regions ecology, biodiversity and sustainable livelihoods, with a focus on the Indian Horseshoe crab and its breeding habitat.